It was great to wake up in our beds Monday morning even if it meant another cold and possibly rainy day awaited. Craig headed out early for work while the rest of us slept in a little before having to ready for school. Ingram helped take the girls to school instead of riding the bus and we got a little breakfast while we were out too. Beau was still at the kennel because he was getting groomed so we made good progress with the laundry before we headed to pick him up. During our lazy day at home, Ingram was starting to not feel good so we just took it extra easy at home. Craig, on the other hand, had a super busy day at work including an interview for work on the Fox Business channel! Ingram watched the interview with me and we got a kick out of Daddy being on TV. It was great too because at the end of the segment, Craig and the hosts of the Market Now were laughing about the economy and race cars and those are two things that we talk about a lot at our house too! I was able to get a link to the segment and put it at the bottom with the pictures. Tuesday morning after the girls were off to school, Ingram was coughing more, had lots of congestion, and even a little fever so I called our clinic at St. Jude to see what we needed to do. This was the first time he's been sick despite everything going around and we weren't sure which direction to go. Our nurse Tricia talked with Dr. Gajjar and what he said next was very exciting..."Ingram's far enough out of treatment that he can go to his regular pediatrician." Seriously did you hear that?? I didn't realize how exciting that statement was until we walked into Dr. Ellis's office and it hit me. We hadn't been there since Monday, April 2nd of last year for an appointment for Ingram. Everyone was super excited to see him and couldn't believe how much hair Ingram had either. After an exam, watching the trucks and trains across the street, a flu test (Ingram didn't even flinch as the q-tip thingie went all the way up his nose! ), and waiting on the results, Ingram picked out a ton of stickers to make up for lost time. It ended up that he only has a nasty infection and has earned the privilege of having Mommy wait on his every need for the next few days while he gets better. Lindsey and Madison didn't have soccer again due to the weather so Craig took them to play soccer in the gym at our church! While they were there, the girls got a huge surprise from Ms. Sherri. Sherri Bonnar, aka Ms. Sherri, had come across a note Madison left at church the week before about misplacing her Vera Bradley purse and had mentioned it to some of her "Vera" friends. Then she went on to tell them about Ingram's battle with cancer and how the girls had raised over $200,000 for St. Jude. Those special ladies wanted to replace Madison's purse and even had already collected some money to do so before Ms. Sherri found out that it had been found. Well, long story short, the "Vera" gals still wanted to give Madison and Lindsey a little something special for all they had been through with Ingram and Ms. Sherri gave it to them last night on behalf of her and all her "Vera" friends. The girls were totally surprised and shocked by the generosity of strangers, but were even more excited that it was from their favorite Ms. Sherri and her friends. Ms. Sherri is very special to us because she has been a part of our church's nursery and has taken special care of each of them from the day they were born. What makes it even more special is that Ms. Sherri is battling own cancer and when she was undergoing her first round of chemo, she sent me a message that she "kept thinking if Ingram can do it, so can I." Since Beau got a haircut before he came home from the kennel, both Craig and Ingram started talking about haircuts too. The funny thing about their hair though is that neither of them have had a real haircut since they shaved their heads after Ingram's first round of chemo. Craig had trimmed his hair a time or two, but Ingram wanted for Daddy to keep growing his hair and he did...even when everyone else kept commenting at how long his hair was. Craig would always say something like "yea I guess I should cut it" but the truth was that Ingram didn't want him to cut it...until tonight. AND Ingram wanted Craig to trim the back of HIS own hair too but he didn't want the girls to know. Craig cut his hair then trimmed the back of Ingram's hair and then he snuck off to his room without telling the girls that Daddy cut the hair where his surgery scar was. Silly little boy! All Cuddled Up Taking The Girls To School! Playing Candyland "Give Kids The World" Edition And Keeping Warm! Daddy On Fox Business Channel Talking About The Economy...And Racecars! Super Excited Beau Sporting His New Haircut On The Way Home From The Kennel! Even Though Ingram's Sick, He's All Smiles To Be Back At Dr. Ellis' Office! Plus, He Just Heard The Train Whistle...Choo Choo! Totally Shocked By Sweetness Of Strangers And Ms. Sherri! Thanks Ms. Sherri And New Vera Friends! "Just A Little Bit Off The Bottom Daddy!" We had a few hours to spare before our flight home and decided to make the most of our time in Dallas. We had a fun brunch with the Smith's at The Dream Cafe in Dallas and even managed to talk while all five of the kids were playing on an electronic device of some sort together at one time. It was a chilly start to the day but once we were in the sunshine on the playground it felt great. There's something about the sun after so many days of clouds that just feels great! Ingram and Jude are both 4 years old and only a day apart in their birthdays, while the girls were stair steps with Dylan being 8, Lindsey being 9, and Madison being 10. The girls were all so cute talking about school, soccer, and everything else under the sun! Next we decided to go to the 6th Floor Museum at Dealey Plaza to show the kids part of United States history. The Museum tells the chronological events of JFK's life including his early career, his run for Presidency, and his assassination. The Sixth Floor has just about every piece of evidence that was collected during the investigation and testimonies from people that were at the parade during the assassination. They even have two corners of the floor encased in glass to preserve how the police found where the shots were fired and then where the gun was found. We all had an audio tour that took us through the whole story of JFK in succession of events; Ingram was even listening to his for a while right alongside us but only lasted about 30 minutes. Lindsey managed to listen for about 45 minutes but Madison surpassed us all listening to every stop PLUS all of the "to learn more about..." sections that were available; she probably even remembers more of the details than we do too. We watched actual video footage from that day and following during the investigation and we ended up talking about his assassination with the kids for quite a while. After all of our craziness over the weekend and walking around Dallas during the morning and afternoon, Ingram was quite the sleepy little guy. We kept him awake in the car back to the airport but once we got through security he was toast! We ran into the Florida State Tri Deltas and talked to them for a bit about fundraising and of course about football. They started laughing when Craig mentioned Tebow and were pretty adamant that their football guys were good guys too! While we were talking to them, Ingram asked for me to hold him so I held him for a bit until we were at our gate; once we were there, we sat down and I covered him up and he was out! While he was sleeping, the Ole Miss Tri Deltas came over and talked about the kids coming down to visit them. Craig took the girls to grab either a late lunch or an early dinner when they ran into the Rhodes Tri Deltas. Our girls were so excited that the Rhodes girls and the Ole Miss girls were on our flight home and so was our sweet ALSAC gal Shelby! Memphis, here we come! Five Minutes After Breakfast, These Crazy Kids Were Trying To Work It Off Already! Monkeying Around At The Dream Cafe! About The Assassination Of President John F. Kennedy. Soaking Up The Super Bright Sun Along With Our History Lesson. They Believe The Bullets Hit President Kennedy. *The Orange Brick Building Behind Us (And The Trees) Is The Texas School Book Depository Building Where They Believe The Shots Were Fired. Saturday February 23rd, Tri Delta Rockstars! Saturday morning, not bright and early, Ingram called from G-Daddy's phone to say he's awake and ready for breakfast. Madison was already leaving our room to go downstairs to see if any of the girls were around so Lindsey headed to G-Daddy's room to get Ingram. I realize I just admitted that my 10 year old daughter was roaming around the hotel and that my 9 year old daughter was going to pick up our 4 year old son and I'm totally okay with that. For those who haven't met our girls yet, you should realize they're very self sufficient already! Soon everyone was downstairs talking to the Tri Deltas for about an hour before we headed to the restaurant for a fun breakfast with G-Daddy! The funny thing about this trip is that even though we had known about it for a few months, we still hadn't figured out who was going to do the talking during the lunch. Normally this is an easy decision, but with a group of 700 college girls, we wanted it to be extra special for our own two girls! Once we got downstairs to the meeting room, we decided to let Madison tell Ingram's story and boy did she deliver it! You could barely see her 10 year old head over the podium and she brought the entire room to their feet by the time she was finished. We were so proud of her and even managed to make it through without tears; however, Madison was so excited that she couldn't keep back her tears and it was just precious. Lindsey, who had been adimant about not talking at all, went up to Craig and asked if she could say something then climbed up the podium as she told all the girls how thankful she was for all the money they had raised. She too got a round of applause by all the Tri Deltas and it made her heart so happy. I could not have been more proud of my girls in that moment; they're rockstars in my eyes just like Ingram! After the luncheon was over, we got up from our table and quickly were surrounded by tons of girls who wanted to get pictures with the kids and to talk to them. Our three got up on the stage and the girls that were with us hopped up too, got their pictures, and talked for a few minutes. We turned around noticed that half of the room was in a line to take pictures with our kids and were blown away. Our Tri Delta and ALSAC geniuses sprung into action and quickly took charge of the line so that everyone there could have their picture taken with the kids in probably less than an hour. It was funny because every now and then, they would pause the line so that our kids could get a drink of water then smile some more; I'm not kidding... these kids are Rockstars!! Our kids had so much fun that there was no way we could drag them away from any of the action either. They stayed with us and helped take down the room by sorting the centerpieces which included throwing miniature footballs, baseballs, and basketballs into boxes to be packed away...Seriously what could have been more perfect for our kids to do?? When that was done, we thought we'd head up for quick naps, but our kids had other plans; they were out mingling around the girls again and getting more attention than they could handle and even more pictures too! Finally after coming downstairs around 11:30 that morning, we dragged our kids upstairs 3:30 in the afternoon for a break only to have Madison and Lindsey head back down at 5:30 to have an ice cream date with their Miss Brittany, Molly, and Luci, also know as the Virginia twins (they're not really twins; that's just what everyone said since they look so alike and had on the same outfits). Craig and Ingram snuck down to "spy" on them around 6pm and quickly got caught by the girls. Then I came down and got totally shut down by Madison and Lindsey and told to leave because they were with "the girls" and didn't need me to take care of them. I had to laugh though because I assumed I had a few more years before this happened, but I guess my girls are feeling a little more grown up now that they've been hanging with their Delta girls all weekend. Once they were finished with their ice cream, they came over to the lobby where we were hanging out with Sarah (ALSAC host and college friend) and ended up playing tag in the hotel lobbby with the Delta girls and the rest of our ALSAC crew before dinner. After we ate dinner, I can truly say that our kids were wiped out and ready for bed...as were the two of us! This is the link for the video of Madison and Lindsey speaking to the Tri Deltas at their Collegiate Leadership Conference; It's about 5 minutes long! Breakfast With G-Daddy In All Their Tri Delta Gear Thanks To Stacy Gillard! Madison And Lindsey With Miss Brittany! The Kids With Miss Brittany, Luci, and Molly From University Of Virginia! 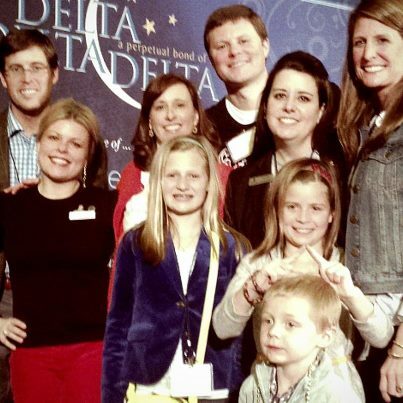 Our ALSAC Team, Sarah Williams, Shelby Anderson, And Brett Collins, And Tri Delta CLC Director, Stacy Gillard. 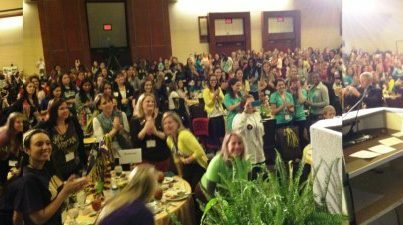 Over 700 Girls On Their Feet For Madison After She Told Ingram's Story! For All Of Tri Delta!! Ice Cream With The Girls...No Parents Allowed!! Playing Tag In The Hotel Lobby With Luci And Molly! Whether To Join In The Game Or Kick Us Out! "No...You're It Madison! I'm On Base!" Thursday and Friday February 21st and 22nd, On The Road Again! It rained all day long on Thursday but the kids all stayed dry at school! Ingram loved going to school today because they were learning the letter "Q" and also had "Show and Tell." He wanted to bring his special quilt that his 2 year old class made him last year and gave him after his surgery. He was so excited about it and even got to sleep with his special quilt during nap time at school. Oh how we love our preschool and the sweet friends and teachers there. I'm not sure what we would do without them either; all three of our kids have been through their program and Ingram is already excited about going into the 4 year old class next year! The girls came home in great moods too because their homework and tests for the night could be put to the side since we were not going to be at school on Friday. Poor Beau, though, he got all wet in the rain and to make things worse, had to go to the kennel because we were heading to Dallas first thing in the morning to speak at the Tri Delta Collegiate Leadership Conference! I'm sure Lindsey would have loved to sneak him on the plane, but for some reason I don't think he would have made it through security, much less an hour and a half airplane ride with our crazy kids before getting caught! We've been waiting for months for this conference to finally get here and I think we were all excited to see more of the Tri Deltas, especially me since I'm the only one that hasn't met any of them yet. I know it sounds crazy, but these girls are not the typical group of sorority girls; they're more like a fundraising company (who just happen to be primarily between the ages of 18 and 22) that blows everyone else out of the water with how much money they raise! Madison and Lindsey were extra excited to see if any of the girls they had met in Virgina back in October or in Memphis at the St. Jude Patient Panel back in January would be there. But first things first, we had to get to the airport for our flight with everyone in good moods which was a little tricky since Ingram kept the girls up till almost 10pm Thursday night! We got to the airport and through security with no problems; I guess you could say our kids are traveling professionals; they even know that once they get through security, they can pick out a snack and a drink for the plane ride. We hung out at our gate for a while and the kids were already in crazy mode; sweet Shelby (one of our ALSAC gals) was entertained for sure while we all waited for our plane to get in since she was on the same flight! Once we got to Dallas, we took our craziness to a new level since we were traveling without Daddy...in a new city with a crazy big airport...with a rental car...AND with navigation that kept telling the wrong direction to go. Don't laugh, I'm fairly smart and can figure out things, but the navigation was making us go crazy AND there was construction all around the airport that was making it even more difficult because we had two sets of signs to follow to get where we were going. Since we hadn't had a great breakfast due to the early flight, the kids "needed" some Chick Fil A for lunch before they melted down into monsters! Once we had lunch and found our way to the hotel (which was actually inside the airport complex...crazy I know!) the girls were set on finding "their people" inside the 92,000 square foot hotel and they did. We saw all sorts of cute girls walking around the hotel and Madison would get so excited; she'd say "I bet their Deltas!" and every time she was right! We ran into our ALSAC team too and the Ingram couldn't have been more crazy with showing them how fast he could run and how high he could jump. Our kids had no lack of energy problems at this point and they decided to go swimming to burn some time until Daddy got in and it couldn't hurt to burn some energy too! The only problem was that the pool was outside AND it was 49 degrees!!! So I, being of sound mind, decided not to swim and watched my three little fish swim all over the pool like it was 80 degrees outside. The only time time they were cold was right before they jumped in and then right when they got out. Lucky for them, it was a heated pool, but I was so cold sitting outside with them that when they finally were ready to get out that I think I was the one ready for some hot chocolate. Daddy and G-Daddy arrived as we were getting out so we started planning the rest of our night together. First up, the girls wanted to go to the workout room and "play" on the machines. G-Daddy and Ingram took a tour of the hotel including the snack shop where they played with race cars and had orange juice and coffee. Madison and Lindsey used the Elliptical machines while we ran on the treadmills; they were dying to try some of the jumpropes, stretchy bands, and the bars. Those two are crazy for sure, but they managed to actually work out while they were playing. G-Daddy and Ingram found us and of course Ingram wanted to work out too and G-Daddy helped him to walk on the treadmill for a second and even put him on the bike too. Our next adventure was to fit 6 people in a 5 passenger car to head to dinner; we're going to "take the 5th" right now and only say that we made it to and from dinner without any complications...other than having to pick a second restaurant! We had a fun dinner with G-Daddy and had an interesting time keeping Ingram awake on the ride back to the hotel. The poor little guy was exhausted since he was up late the night before with his girls at home, woke up early to get to the airport, and then had been going nonstop since our arrival in Dallas. The best part of the night though was when Ingram asked G-Daddy if he could spend the night with him! The girls took Ingram and his stuff down to G-Daddy's room for a good night's rest and everyone was in bed at a fairly decent hour to get rested for our big day with all the Tri Deltas! Apparently Beau Needed A Better View On The Way To The Kennel! Happy Nappy At Preschool With His Special Quilt! Dallas Texas Here Comes Trouble!! We've Been At The Hotel Less Than 5 Minutes! 49 Degrees And Sunny...Perfect Swimming Weather?? Madison Was Just Trying To Help Lindsey Get Warm! G-Daddy And Ingram Playing With Cars! Notice The Tri Delta Shirt!! Ingram..."But I Can't Reach The Pedals!!" Ingram and the girls were happy to be back at school hanging out with all their friends after the long weekend. I came home and actually got a lot done before the kids got home from school, but still feel so behind in so many areas! It however quickly turned into a regular soccer night with Madison having practice at one soccer complex while Lindsey had a game at another complex at the same time. Ingram was loving the car ride because he passed McDonald's a few times along the way and kept telling me to pull over for his dinner (of which I did not do!) and then he went about playing his game. It was super cold and I have to admit that even though we were bundled up, I was very happy when he told me he was ready to leave to get warm. "Super Dad" finished out the game with Peanut then picked up Madison from her practice only to bring them home to a terrible tasting Chicken Tortilla Soup I had made AND company at the house. Did I mention they both had soccer which meant they both smelled bad and needed to eat dinner and needed to shower all before they could go to bed?? So it begins at the Dismuke house again for another season of competitive soccer which we really do love! Both of the girls have great friends on their teams and despite the crazy hours we keep and the amount of gas we guzzle through, they love playing soccer so we keep it up. Back to our company, Mr. David and Mrs. Laurie came in town for Mr. David's birthday and stopped by the house so it wasn't a big deal with all the chaos and bad food, they're used to it! Wednesday was exciting for us because we were back at St. Jude and I noticed myself waving wildly at the security guard as we were coming through the gate of the parking lot. I chuckled and so did Ingram because he was just as excited to be "home" just like me. After we saw Mrs. Penny and Mrs. Gloria, we headed over to the lab to get his port flushed where we saw our first set of familiar patient faces, our sweet friend Jacqueline who is a little over 2 and was diagnosed with our same tumor type about a month after us. We could tell she was excited to see us too, but she started talking in Spanish and her mother and I started laughing and Ingram just said his traditional deep voiced "Hey" to her. Back in the lab, we had Mrs. Virginia (who we love) and she couldn't believe how much Ingram had grown. Ingram took it one step further and told me he didn't need for me to sit with him while he got poked and I said we could try it and see how far he gets. Well with Mrs. Virginia on his side, he was listening to her talk the whole time he was getting poked and he didn't even need me to hold him at all. We're soooo very proud of him and can't believe he's to this point on being such a big boy. After labs, we ran to the Cafe for snacks to celebrate (they have a candy jar bar) and Ingram picked Hershey Kisses and M&M's and Blue Gatorade for his treat. We ran into another friend that we were hoping to meet today since we had been messaging back and forth for a few months now. I love when we can actually meet people face to face that we've been talking to for a while; by the time you actually see the person, you already feel like family! Ingram had speech with Mrs. Angela and he had the best time as they worked on blends and then it was off to lunch. Once the girls got home from school, Ingram was still talking about sitting by himself and we were having fun while doing homework and snacks before we headed to drop off Ingram and Madison with Craig to speak at our church tonight in the Youth Department. As we were heading to Craig's office, it's like everything came to a screeching halt. Not the car or anything like that, my heart just sank as I found out that Aaron Bell, known as Aaron the Amazing, lost his battle with Ependymoma just an hour earlier. Aaron's family is another one that we have been talking with long before we met in person too. Aaron had been battling our same tumor since his initial diagnosis back in 2007 and we met them in the hallways of SJ in the Fall, saw them again at the Memphis Marathon Hero Pasta Dinner, and more recently, in January when they came in for his scans after symptoms starting coming back. Our hearts go out to his parents Kristie and Chris as they had to walk their 17 year old only son through the finals days of his life. We hate you Ependymoma. That Didn't Hurt At All! Sunday and Monday February 17th and 18th, Special Times! After a great brunch at the Peabody with friends, we headed home Sunday to get Madison and have some special "alone" time with her. She helped me get a few errands done before we made it back to the house. We took her out to dinner and enjoyed plotting what all we were going to do without Ingram and Lindsey. We decided to paint Lindsey's room since Madison's room was painted as part of her Christmas present. Lindsey had been patiently waiting for her room to be painted purple and turquoise so that's just what we did. I fell asleep while Craig and Madison watched Killing Lincoln on TV and ended up staying up until almost midnight! The next thing I know is Madison is asleep right between us since no one else was upstairs; apparently she asked Daddy if she could sleep with us and of course he said yes! She ended up sleeping till almost 10am and then ran upstairs to help us paint. She did a great job helping and was actually excited to do something special for Lindsey. Back in Jackson, Ingram and Lindsey got to go to church with my parents and my sister and brother in law; they were able to meet tons of people that had been praying for our family. I know my family was very excited to be able to "show off" Ingram and Lindsey to all of their friends that had been praying for Ingram and also donating to St. Jude. Then they went to Mimi and Pop's house for a fun lunch and played all afternoon; then the big kids went to the movies while Ingram took a nap. After more playing with all the kids together, Lindsey and Carley had a girls night at Aunt Amye and Uncle Len's house and Brett and Ingram had a boys night at Mimi and Pops' house. Sometimes it's easier to divide and conquer if you know what I mean!! Another fun thing for today Monday was that our Valentine's present was delivered to the house and we were so excited. Madison decided we (me and her) needed to take a break from painting and make a smoothie in our new Vitamix!! It was so fun and we added all sorts of crazy fruits to it...seeds and all! It came out as pure liquid happiness as we put in apples, grapes, kiwi, strawberries, plums, spinach, and ice to make our first of three concoctions for the day. Craig even drank it and he's never had that much fruit or vegetables at once; we were sooo very excited about it that we made Chocolate Ice Cream in it when Lindsey and Ingram got home and then another round of smoothies again before bed that night; not too bad for only having it for about 10 hours so far! Monday night, two of Lindsey's friends, Ella and Sara, came over to drop something off. Well, what they dropped off was a whole bag of board games and about $200 that people had donated to St. Jude! Instead of getting birthday presents, Ella and Sara asked people to bring donations for St. Jude. We were so excited and can't wait to take these to SJ for them to use in the different areas of the hospital with the Child Life Specialist! I love that their compassion for St. Jude didn't end just because the official fundraising for the Marathon Weekend is over; both of these girls and their families were a part of Team Ingram and we couldn't be more excited to call them friends! His Best Bet For Stealing Breakfast! Lindsey's Creativity In The Form Of An Oreo Stick Person! Lindsey With Ella And Sara! Ingram Couldn't Resist Jumping Into The Picture! Lindsey's New Purple and Turquoise Room! Saturday February 16th, The Company Party! Friday Febraury 8th, Memphis News Debut! Updated TV Interview...Including A Sneak Peak! !